At the top of almost anyone’s comfort food list is a savory pot roast. It’s a cornerstone dish for family Sunday dinners all over America. What’s more, large roasts offer leftovers that taste even better the next day thanks to new delectable gelatin being formed during the cooling process. It’s true that most pot roast recipes include vegetables like potatoes, carrots, onions and celery to boost the flavor of the meat (and let’s not forget the juicy gravy!). Because of all that, these meals can exist practically on their own without anything else added. But sometimes you need more for a well-rounded meal. Enter pot roast sides, where we add to an already delicious plate that will only further aid in satisfying strong appetites. So what can you serve with a pot roast? You can compliment it with more filling fixin’s, or you could balance out your naturally hearty meal with some simple veggies. There really is no right answer. Some agree you simply need a starch to help soak up the liquids such as homemade bread or rice. Others prefer a light and crunchy accompaniment such as a crisp salad to offset their tender cut of beef. Yet, others long to just pile it on with more rich foods like traditional mashed potatoes or mac n’ cheese. Below are 15 excellent possibilities where any one or two or even three you select will end in complete convincing that you made the right choice. Again, no right answer here. You can win every time. Just don’t forget to add dessert! 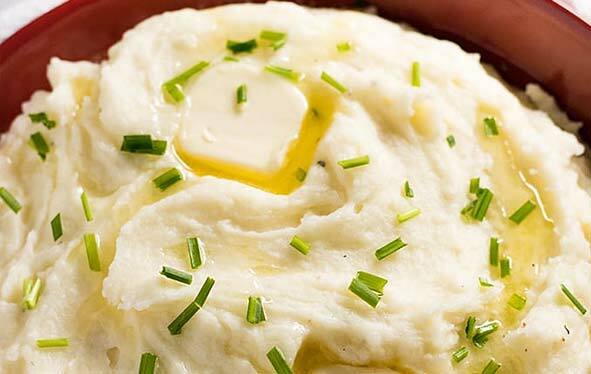 One of the staple side dishes for pot roast, there’s no denying that a side of mashed potatoes completes a masterpiece comfort meal. See the recipe below for a to-die-for twist on whipping up some tots. Nothing soaks up gravy and liquids like a fluffy dinner roll. Biscuits can work too, but there’s something divine about a super puffed out buttery ball of bread to go with a gravy-laden pot roast. Follow this awesome recipe to get, as Rachelcooks.com puts it, green beans that are “crispy and flavorful”. This is about as good as it gets for a fresh complimentary side to your pot roast dinner. For a smokey flavor, plug in your electric smoker and cook these up outdoor country style. Alia at Every Day Easy Eats says that food can still taste wonderful despite being completely uncomplicated and simple. Egg noodles is the perfect food canvas for any pot roast to lay on top of. A sweet, refreshing and velvety applesauce side can augment your meal tremendously. Mix together your own applesauce for the freshest and best tasking side dish that’s on a little on the sweet site. Anyone who follows chefs and culinary personalities knows The Pioneer Woman. She doesn’t let us down when it comes to pureeing apples. It’s too easy to pass up. Asparagus cooked just right is also too delicious to overlook. And it makes a perfect side dish. Elise at Simply Recipes suggests using the fattest spears you can find for that extra yum you get from oven roasting. Too thin, and you risk getting a dried up green that no one will want to eat. Take ’em out of the oven, spread on the butter and you’re in heaven. 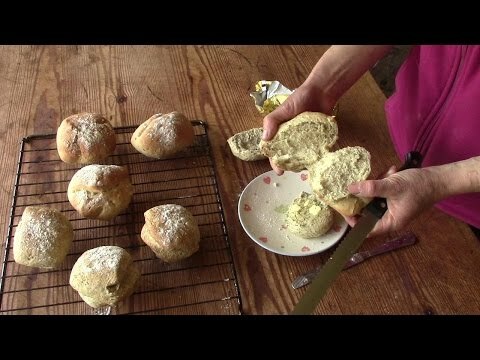 If you’re looking for a different kind of bread (other than french rolls), you have to try nettle bread. A little known pot roast side favorite of those that have tried it. Check out the video below and create some of your own to your own delight. What a combo of veggies. This is an excellent choice for a side of vegetables for your roast, even if you’ve already used carrots and potatoes. Try out this dish that is seemingly as old as time. Chef John at Food Wishes gives you the complete low-down on why this dish is so good. If you preserve vegetables, this is an excellent chance to cut them up use them. It’s funny, we didn’t really grow up with sweet potato fries but they seem to be everywhere now. They go with just about anything, and a pot roast is no exception. Follow this recipe from Cooking Classy for a delicious take on crispy AND sweet fries. Tip: Make a lot because they’re hard to stop eating! A casserole makes an amazing side dish when it’s this one. As Kate from Framed Cooks puts it, this is the dish that your eaters will request seconds for…and maybe even thirds. It’s that good. 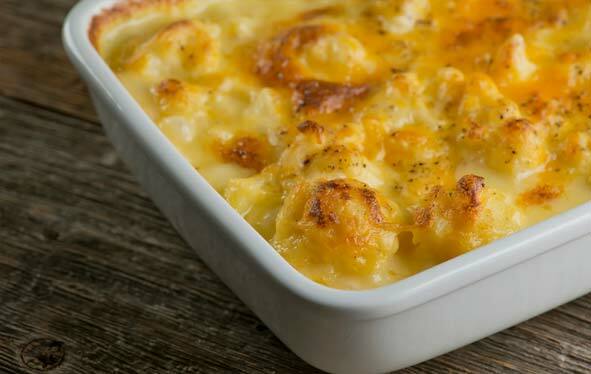 A nice blend of cheese and the neutral taste and texture of the Cauliflower simply make this work wonderfully. Make this side dish ahead of time and enjoy with your roast. It’s one of a few low-carb pot roast side dishes listed here, and it will please anyone who likes prepared spinach. Okay, so it’s not a side dish and it isn’t something everyone in a young family can enjoy. But if you’ve ever enjoyed it with a post roast, you know why we’re adding it here. It simply has to be mentioned when you talk about what to pair with pot roasts. Which red wine specifically goes well? Most will suggest a Syrah. It always compliments well with a hearty beef-based meal. Roasting vegetables is a modern day trend for good reason. Roasting makes veggies taste like, well not veggies anymore! This next side dish is not your childhood brussels sprouts. It would seem they aren’t even in the same food group (really, they are!). You need to try this recipe and way of cooking if you haven’t already. You will not be sorry…and you can let your mom know you eat brussels sprouts now. Rich and savory, butter beans are a lesser known side. They are a southern favorite. Some say you can use lima beans, but check out the recipe below for a pleasant surprise. If you’re familiar with these, you already know what others might be missing. We end our list with another treasured classic. Pile it on top, on the side or in a separate bowl… it doesn’t matter. Mac & cheese mixes beautifully with any pot roast. This is one side that really goes well with a roast cooked up in a smoker. In reality there are a whole lot more choices than the ones mentioned here. These are just a sampling of both popular and longstanding sides as well as lesser known but just as good ones. We’ve all had pot roast sides of peas, rice and salads so don’t think we’ve forgotten those staples either. In fact, a fresh green salad with Romaine leaf lettuce and a fruity vinaigrette may be all you need. How does a pot roast cook anyway? When you get right down to it, a pot roast is cooked by braising. This is a cooking process that is based entirely on heat and water. By flavoring the water and enclosing it in a sealed pot you ensure a tasty and palatable delight for your mouth. You can accomplish this in an oven, a slow-cooker or a multicooker like an Instant Pot (see our instant pot reviews for more info about pressure cooking meals you can normally make in a Crock Pot). When you flavor your liquid with things like carrots, onions and potatoes you already have some built-in pot roast sides to put on your plate. A Yankee post roast, which is defined as a meat with potatoes and various other vegetables, came from an age old tradition in New England. They would literally boil dinner, borne from colonial times where you essentially use whatever you have available in the kitchen and prepare a one-pot meal. This usually consisted of tough cuts of meat and a collection of root vegetables. When you get a cut of primal meat for your roast, it contains a lot of connective tissue–fats that help bind the muscle fibers together. You’re essentially over cooking the meat with a roast. And as you normally lose moisture from the muscle tissue with too much cooking, this is offset by the gelatin that is created. In other words, the fatty tissues that melt into the meat. The flavorful liquid also infuses into as the structure of the meat breaks down. Before braising the roast, most cooks will sear the meat first. This browning or “crusting” effects is often thought to seal in the juices (or at least that’s what everyone says, right?). The truth is it doesn’t. The juicy result you get comes from what we described above. That said, searing does provide for enhanced flavoring. Now it’s time to further enhance your recipe by picking your favorite pot roast sides and complete traditional, but by no means bland meals.